Windows XP was released October 25, 2001. More than 12 years later, on April 8 2014, Microsoft will end their support for Windows XP, automatic updates that help protect your PC for Windows XP will no longer be available. You can continue to use Windows XP, but your computer might become more vulnerable to security risks, and harmful viruses, spyware, and other malicious software, which can steal your personal information, passwords or financial details. For several years now microsoft has been releasing monthly security updates for Windows XP. Some of these updates fixed problems reported by security researchers, others fixed problems that have been found being actively exploited by hackers. These problems will no longer be fixed. In the past, several new innovative security features were introduced in Windows XP, such as a Built in Firewall, and Windows Security Center. Newer versions of windows have significantly improved windows security with features such as User Account Control, Inbuilt Windows Defender, Secure Boot, SmartScreen for web browsing, more secure versions of Internet Explorer, and various technologies to make it harder for viruses and hackers to exploit problems found in your computers software. Your Windows XP computer will still work after April, you wont notice any immediate change, over time however your computer may become more vulnerable to viruses and malware. It will also become more difficult to update software, or install new software, as many vendors will stop supporting Windows XP. Hardware vendors will likely stop designing devices such as printers and cameras to work with Windows XP. Many popular websites are updated to work with newer web browsers designed for newer operating systems, they will also stop designing them to work in older web browsers. Over time it will become difficult if not impossible to run up to date web browser on windows XP. If you dont want to upgrade, you can continue to run XP. If you do continue using Windows XP, you should be aware of the risks. 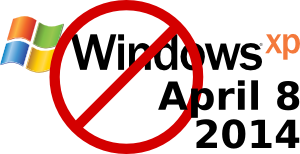 We strongly advise that after April you should avoid exposing a windows XP computer to the outside world, via, internet connections, or removable disks etc. and you should absolutely not browse the internet to unfamiliar or untrusted websites. Antivirus products are never a guarantee against malicious software. It is likely that AV vendors will begin to stop providing their software for Windows XP once Microsoft ends support. You may be able to upgrade to a newer Microsoft operating system such as Windows 7 or Windows 8.1. You can check your computer's compatibility with “Windows 8 Upgrade Assistant” tool on Microsofts Website. For many people, upgrading from windows XP will mean purchasing a new PC.